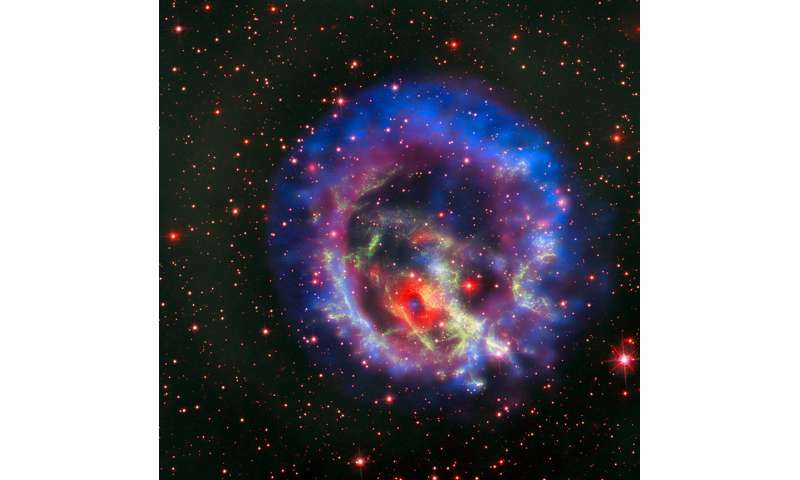 The neutron star is located within the remains of a supernova—known as 1E 0102.2-7219 (E0102 for short)—in the Small Magellanic Cloud, located 200,000 light years from Earth. A paper describing these results was published in the April issue of Nature Astronomy, and is available online. However, in this scenario, it is difficult to explain why the neutron star is, today, so neatly encircled by the recently discovered ring of gas seen at optical wavelengths. Not if you understand that all superdense stars form and periodically eject newly formed matter therefrom, creating their own obscuring cloud in many instances. Or reach for any other possible patch, to maintain the fantasy model, as cosmologists are restricted to doing, if they want to continue getting published and avoid ridicule. Don't think, just conform, like the Repubs worshipping the Donald. And only an idiot would believe such a thing.